Our custom home plans begin with your vision to create a very unique and personal home. We apply a combination of 23 years of custom home design experience in the Southern Oregon hills with our infusion of exciting new construction concepts and design products to provide you with a very pleasing and satisfying home design. 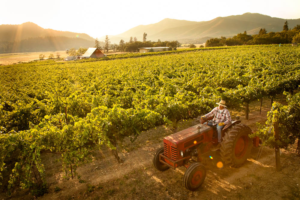 The Applegate Valley is home to many of Southern Oregon’s top vineyards. Photo of Valley View Winery by Jared Cruce. Typically, we start with the site layout to understand and present the orientation of the home properly. We take advantage of views and other geographical features of Applegate, OR and the Applegate Valley. From the site layout, we develop a home floor plan, taking into account the home owner’s vision for the interior space and room design. We are always considering the exterior look of the home while we create your interior spaces. Once you are satisfied with your home floor plan, we go on to develop the exterior views and “elevations” of the home. Some adjustment between the floor plan and elevations may be required to realize the exact look you want to achieve. Our complete sets of custom home plans include the site plan, floor plans, elevations, foundation, floor framing, roof plan, sections and the construction notes. We take into consideration the specific needs of home owner or builder during the home design phase and throughout the process, while always keeping Applegate local and Jackson County building codes at the forefront of our design development. Please refer to our architectural reference for any specific styles or elements you may be interested in. Pricing for our Custom Home Plans in Applegate, OR vary. Please call 541.608.3956 or e-mail us at carole@designresidential.biz for pricing and information. Click here to contact us to begin the process of an excellent custom home design. “Sustainable” home design is a passion of ours at Design Residential, Inc. We were the first design firm to be designated an “Earth Advantage” affiliate member in Southern Oregon. We view the entire home as a combination of systems that can work in concert to provide energy efficiency, sustainability, indoor health, air quality, and resource efficiency. FOR THE BUILDER: Dress up your promotional materials with 3D renderings! Copyright © 2018 Design Residential, Inc.